The Royal Society is a scientific Fellowship whose mission is to recognise, promote and support excellence in science. To do this their membership comprises some of the most notable figures from science, engineering and medicine across the globe. 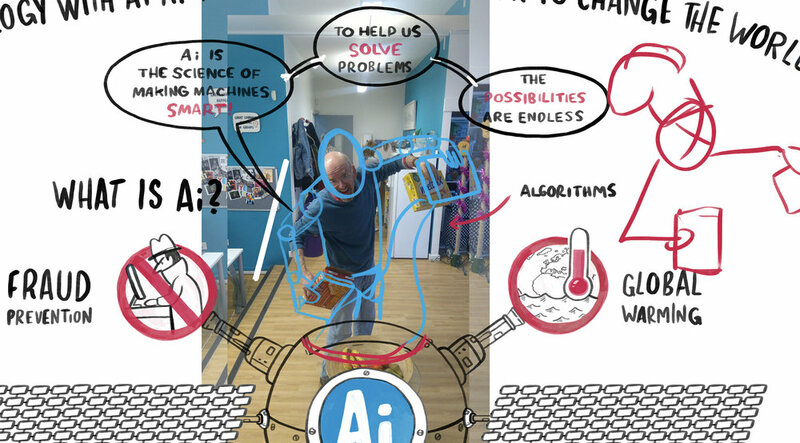 With AI becoming an increasingly ever-present part of our lives The Royal Society wanted to create a Whiteboard Animation which not only explored the subject in a balanced way but also encouraged its viewers to talk about AI. The challenge for us was to unpack the diverse subject that is AI and give it a neutral treatment, looking at the way we use and interact with it today and the possibilities for its development in the future. 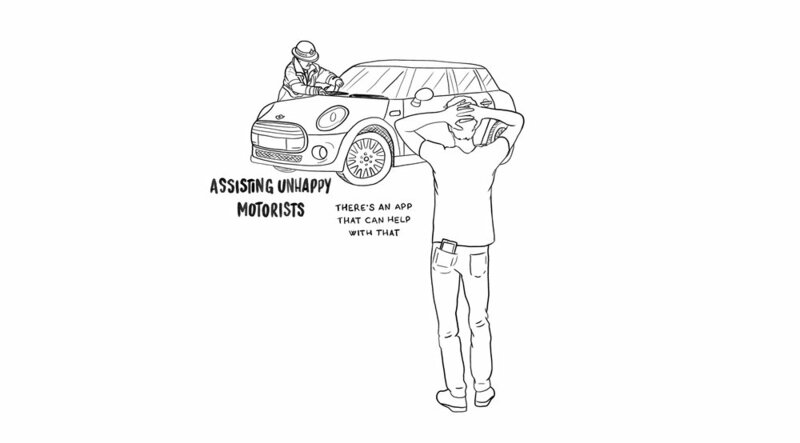 Made for the public, this Whiteboard Animation had to be engaging, approachable and informative. Perhaps bigger than these challenges, it had to stir people’s curiousity to discuss and explore the conversation further. From parking tickets to calculating the size of tumours, AI is a rapidly expanding facet of our lives, assisting us in a wide range of activities. It’s important to recognise what AI is and the fact that AI has been part of our lives for sometime. In many ways it makes our lives easier and empowers us but looking to the future it has potentially negative implications for areas such as equality, employment and the justice system. 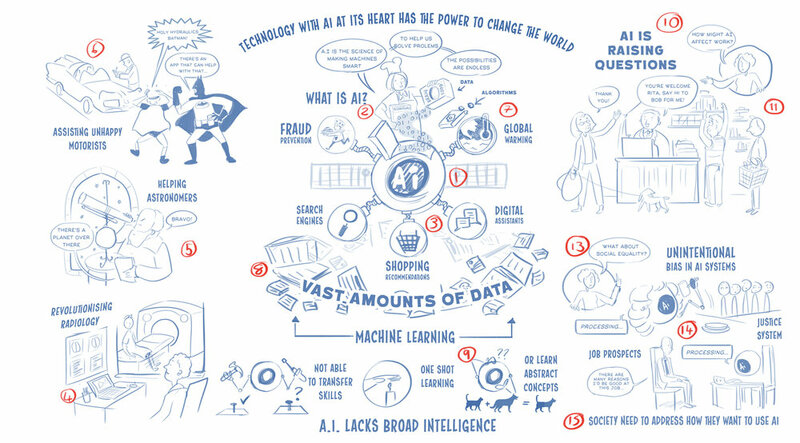 AI is changing our world. If we engage in shaping its development we will be more able to ensure a better and fairer future. To create an informed discussion, we used a centerpiece to connect the many aspects of AI Building on this, an important part of telling this story was the use of a recurring character to create a sense familiarity and charm while further connecting the various aspects of AI. We used a series of simple and powerful metaphors to explain the different areas of AI, from a description of how it operates to its current uses and future considerations. Metaphors such as our character trying and failing to distinguish between cats and dogs showed the limitations of machine learning and our character presiding over a court room suggested one potentially negative direction AI could take. Crucially it ends with a call to action, asking people to become part of the conversation and take an active role in shaping the future. 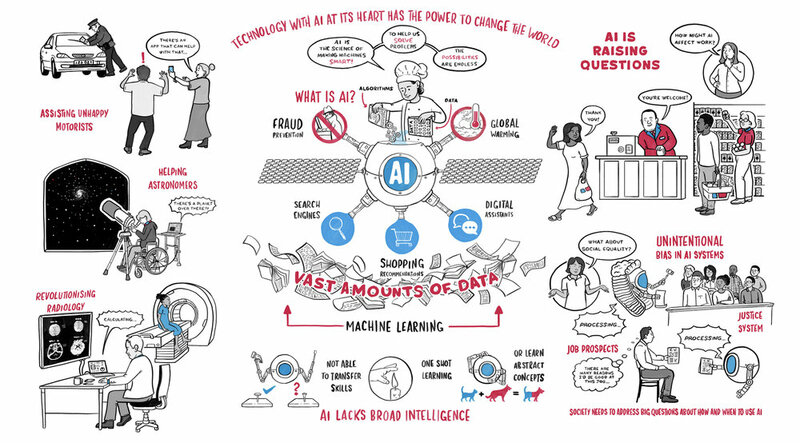 Find out more about AI from The Royal Society here and join the conversation.